An infant’s vision can change dramatically in the first five months. Every few weeks, your child’s vision will change making it easier for her to interact with the world. In other words, your child isn’t born being able to fully see what we see. Let’s take a closer look at how vision develops after birth. It’s impossible to determine if infants can distinguish between colors. While a child may be attracted to the contrasting colors, they may not be able to distinguish different colors. At two to six weeks, the baby can tell the difference between highly contrasting colors, such as black and white. Before the age of two months, it is possible for babies to focus on objects, but they aren’t able to do so really well. This is due to the fact that several muscles must work together in or to focus on objects that are close or far away. At the age of two to three months, the child’s eye muscles will learn how to complete this task. It’s also around this time that object/facial recognition comes into play. At birth, a child will be able to see facial features at up to 12 inches away. However, the child will look at the contrasting borders of the face, such as the hairline. 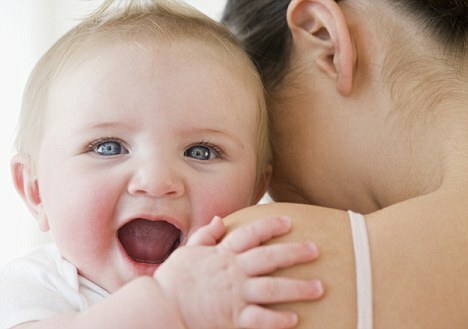 At two to three months of age, the child will begin to notice facial features, such as the nose and mouth. It isn’t until three to five months of age that the child will be able to distinguish between the face of its mother and a stranger. Babies are not born with the ability to determine how close or far an object is. It isn’t until three to five months of age that the child’s eye muscles develop in a way that they can determine depth perception. At three months of age a child will also begin to start following slow moving objects, but the tracking will not be smooth. It isn’t until around the age of four months that babies will be able to smoothly follow slow moving objects and begin to reach for them. A child’s vision can change dramatically in the first five months. It’s important that parents know what to look for so they can help determine if the child’s vision is developing properly. If you notice that your child’s eyesight doesn’t seem to be advancing as it should, you need to take your baby to the pediatrician for further diagnosis. About the Author: Hue Apt has worn eye glasses since the age of 5 and has always been fascinated by the human eye and overall developments in vision.